This is cotton drill cloth bonded with a rubber compound to a soft flannel. Very tough and durable, and well suited for schools, churches, and studios. least likely to snag when kitty tries to jump up on the piano. situations where people are likely to set a drink down on the top of the piano. but the nylon material is slightly lighter, and the cover will soak up water spills. If there is a chance of liquid spills, do NOT order this cover. sheds water very well, though standing water may eventually soak through. area. This cover looks the great under stage lighting. Mackintosh above. The outside layer is Mackintosh with quilting throughout. for schools or public venues where durability and protective padding are important. vinyl. The inside layer is a dense gray felt material. This cover is not prone to snag easily. This is a very nice looking quilted cover with a sheen, and it is completely waterproof. Available only in black. Then go to the next chart to find the price. length, using the instruction graphic at the right as your guide. the page for ordering a custom made cover. 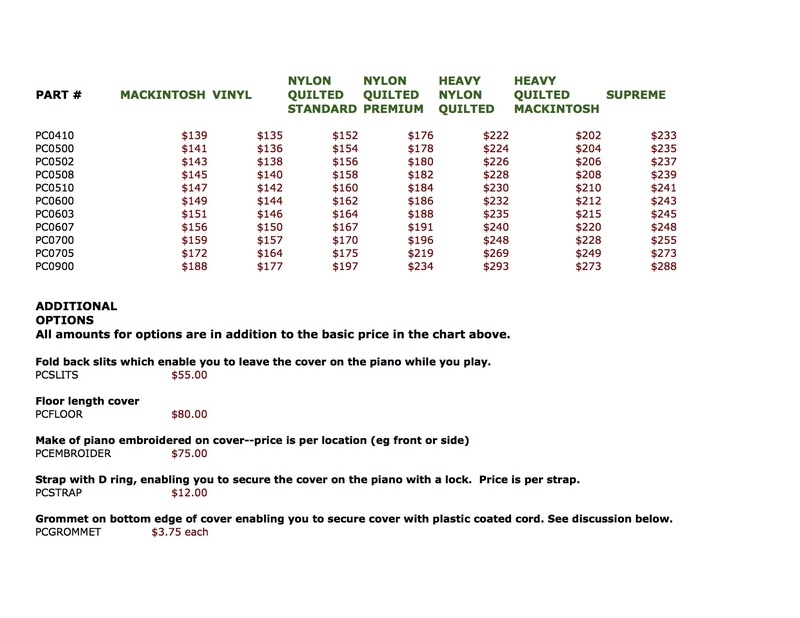 There is no extra charge for custom made covers. 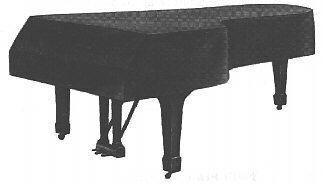 * Steinway A, 6' 1"- Part Number PC0603-- We MUST know if you have a piano with a square tail of round tail. Please SEND MAIL for prices. 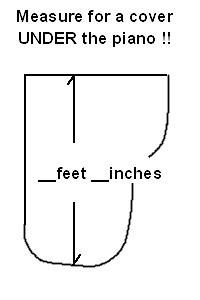 Tell me the length by using the instructions in the above graphic. I would also like the model number which is in your literature, or it is on the harp under the desk in the tuning pin area. How to price the cover for a piano in these lists. Find the same length piano anywhere in the above chart, and then look at that Part Number in the chart below. If your piano is not listed on this page, measure it UNDERNEATH the piano from in front of the keys to the far end of the curve, and find a piano the same length in the chart and price list. Wurlitzer Grand Model C173 - 5' 8"
Wurlitzer Grand Model C153 - 5' 1"
Wurlitzer Grand Model C143 - 4' 7"
Chickering Grand Model 507A - 5' 7"
Chickering Grand Model 507CD - 5' 7"
Chickering Grand Model 507DL - 5' 7"
Chickering Grand Model 410A - 4' 10"
Chickering Grand Model 410FP - 4' 10"
Chickering Grand Model 410QA - 4' 10"
Nordiska, Story & Clark, Hallet & Davis, and Hardman are made by IMNSHO, Dongbei in China. Ritmuller and Henry F. Miller are made by Pearl River in China. Find the price next to your Part Number, and decide which fabric you want. You may have to set your screen pixel size larger to see the chart correctly. Find a piano in the top chart the same length as yours (measured underneath the piano). Use the yellow chart to find the price for that piano. That is what you will pay for your cover. 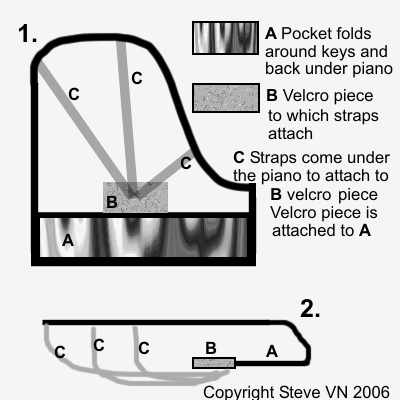 Step One above tells you how to make a pattern of your piano top for our cover maker. Do you live in an apartment or condominium and cannot play at night? People below complaining? See our selection of sound control products. Black or Brown Vinyl, or Black or Brown Nylon Quilted, Standard or Premium, cover. Please have the order number and price on hand when you call. The normal side length of a Grand Piano Cover is about 17 inches. 1. I need the exact distance from the top of your piano ( lid closed ) to the floor. 2. You need to add $ 80 to the cost of the cover as you found it in the above chart. This applies to any material you choose. 3. Shipping will also be more and will be figured at the time of sale. This sounds strange I realize, but there is sometimes a need for one leg wrap. Velcro straps to hold the cover on the piano leg. for making a pattern of the top of the Harpsichord and mailing it to us. and contents of the church pulpit. CLICK to return to the menu for other covers. For a quote on a matching set of Piano, Organ, and Pulpit covers, send mail. We offer locking straps and grommets for full sized covers. but the point is to discourage casual playing and opening up of the piano. Price: $ 12.00 added for each strap section. of the cabinet, which meet in the center for locking. easily to lock and unlock the strap. Price: $ 18.00 for one strap and "D" rings. Added to lower edge for securing the cover. cable and lock can scratch the piano as the cover is removed. padlock it and prevent removal of the cover. Price: $ 1.75 added per grommet. less material is used, and the sides are visible. to the piano, the fall board and the top of the piano cannot be opened. and piles of rubbish on the piano. 3. The cover is very easy to put on and take off. 4. The cover will prevent dust from settling on the piano. the piano to protect the top edge and shed liquids from spills. Here is a diagram of the cover. It is a bit difficult to make this clear, so please feel free to call and discuss it. everything together at that point. can be padlocked in place. For looks?-- These covers do not look ambient. Buy a full cover please. Find your piano in the charts at the top of the page, and call. We will give you a price on the phone. Discounts for quantity. 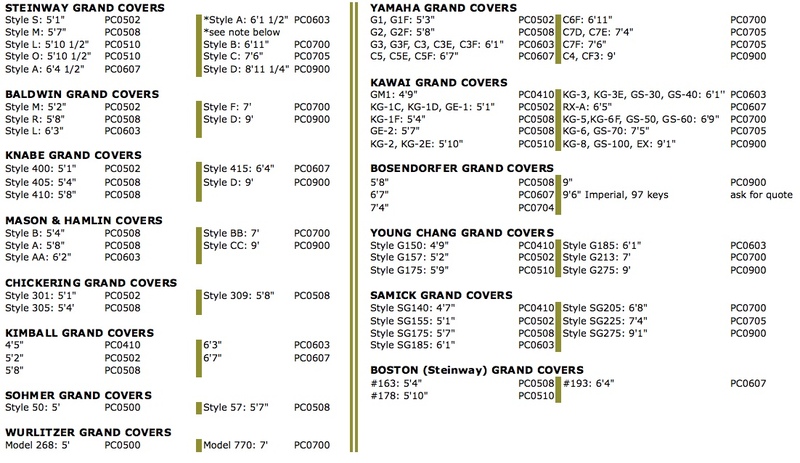 If your piano is not listed above, here is how we can supply one for you. We also offer covers for electronic / acoustic hybrids by this method. Serial number if you can find it. For square grands, send E-Mail. Send me the pattern and your Order Form and check. Call re shipping to Alaska & Hawaii. Canadian orders shipped US Post Office Priority Mail only. Please call to inquire about International shipping & return policies. defective, you MUST call us for instructions for returning the cover. Contact us by E-Mail if you don't understand.